The Coldest Journey is one of many great tales of bravery and daring to be featured in Sir Ranulph Fiennes latest book, Cold. 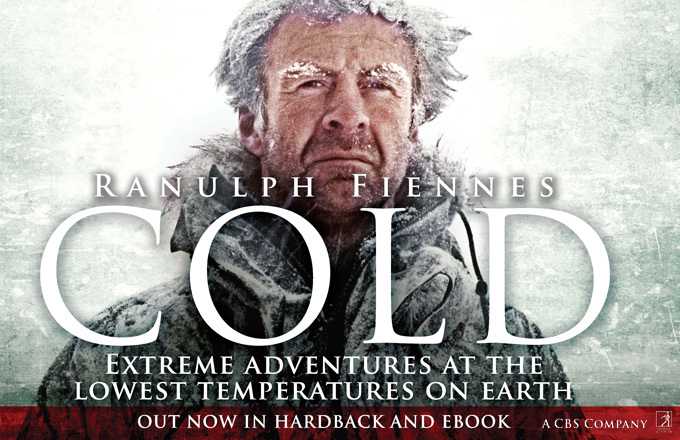 Fiennes has spent a lifetime working in conditions of extreme cold – his frostbitten fingers are a testament to the horrors that man can experience in such temperatures, but he also knows that the life he has led owes a great deal to the cold. Both scientifically rigorous, historically questioning and intensely personal, Cold is a celebration of a life dedicated to researching and exploring some of the most hostile and brutally cold places on earth. In it, Fiennes reveals the chequered history of man’s attempts to discover and understand the remotest areas of the planet, from the early voyages of discovery of Cook, Ross, Weddell, Amundsen, Shackleton and Franklin, to his own extraordinary feats; from his adventuring apprenticeship on the Greenland Ice Cap to masterminding the first ever attempt to cross of the Antarctic during winter – namely, The Coldest Journey. Cold is available to buy from all major booksellers, including Amazon, The Book Depository, Hive, Tesco, Waterstones and WHS. Follow this link to find out more about this remarkable book, and how you can order a copy online today. Cold is also available as an eBook.